12% DISCOUNT RUNS THROUGH MONDAY, 9/3 ONLY! This is one sweet deal — but like that cherry pie — it just won’t last! Summer may be coming to a close and Fall fast approaching, but Green Smoke’s Labor Day Bonanza is just getting started. You’ve read all about Green Smoke’s second-to-none quality, taste and vapor. Their e-cigarettes have earned a five-star rating at eCigs HQ and other sites. Now you can enjoy the best for less with 12% savings* on your purchases. 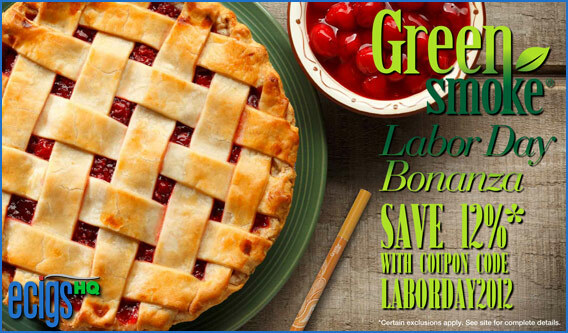 To take advantage of the tasty savings, click the banner above or the link below to visit Green Smoke Official Website now and be certain to use coupon code laborday2012 at checkout to save 12% on your Green Smoke purchases. *Certain exclusions apply. See Green Smoke website for complete details. Click here to read the Green Smoke Review.